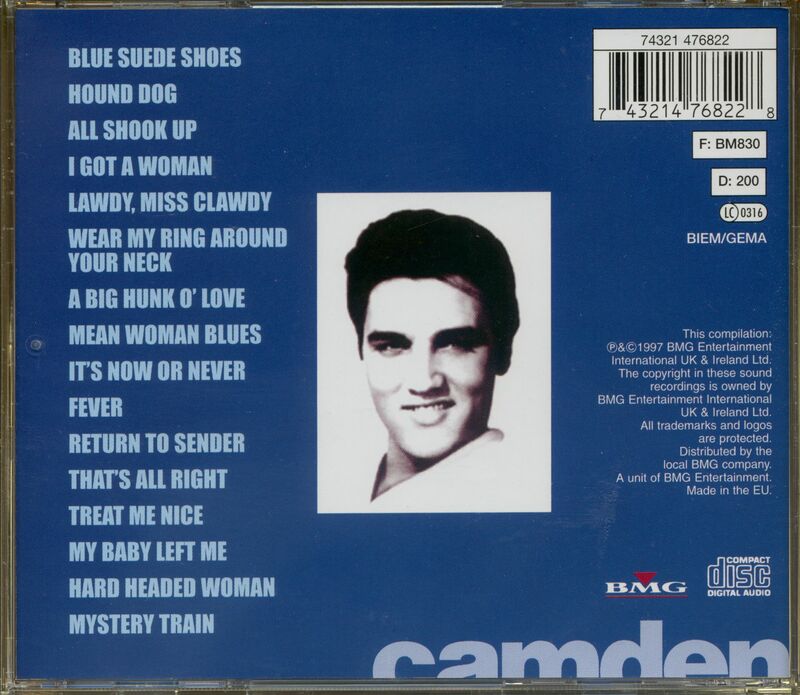 (1997/BMG-Camden) 16 tracks, notes by Roger Semon. On July 5th, 1954, Elvis Presley, attended his first official recording session at Sun studios on Union Avenue, Memphis, Tennessee. At first. he was more interested in singing ballads but Sam Phillips, the perceptive studio and label owner, persuaded Elvis - who was accompanied by Scotty Moore (guitar) and Bill Black (bass) - to continue experimenting with the old Arthur Crudup blues classic, 'That's All Right [Mama)." Phillips was thrilled with the result and in August. it became Elvis' first commercial single release. During the next year, four more Sun singles would be issued prior to his signing with RCA Records in November 1955. His last Sun release coupled Junior Parker's "Mystery Train" with "I Forgot To Remember To Forget" and they reached No.11 and No.1 respectively on the US country chart, giving Elvis his first ever chart - topper. On December 3rd. 1955 Elvis' first full-page national advertisements appeared in Billboard and Cashbox. RCA touted Elvis as "The Most Talked About New Personality For Ten Years!" Even at this time, RCA didn't really know what they had latched on to. They were just thrilled, according to a sales release, -to have acquired the most dynamic and sought after new artist in country today who's topped the 'most promising' category in every trade and consumer poll held during 1955." Elvis' first recording session for RCA was on January 10th 1956. The first two songs he recorded were the Ray Charles classic, "I Got A Woman," which appeared on his debut No.1 album, "Elvis Presley," and "Heartbreak Hotel," which became Elvis' first official RCA single release on January 27th. In May it reached No.1 and No.2 on the US Billboard and UK NME Top 30 singles chart respectively. Elvis' second session for RCA was in New York between January 30th - February 3rd, where he recorded the Carl Perkins composition "Blue Suede Shoes" and Lloyd Price's1aWdY, Miss Clawdy". They were subsequently released as singles in the UK, In May 1956 and November 1957, reaching No.9 and No.15 on the NME chart respectively. Elvis was now capturing the hearts and minds of liberated teenagers in the UK, as he'd already done in the US. 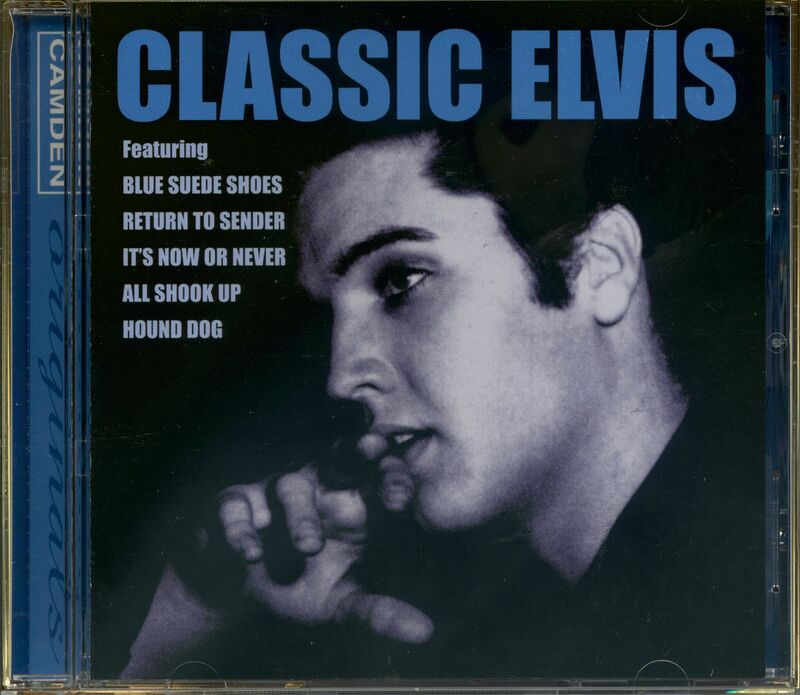 In July, RCA released one of Elvis' true classics, "Hound Dog." Written by Leiber and Stoller, it was first recorded by Wliiie Mae 'Big Mama" Thornton in 1953. Elvis' version relied heavily on Freddie and The Bluebells version from 1955. When Elvis performed this on the "Milton Berle Show," June 5th,1956, conservative America deemed him vulgar and disgusting but the kids just loved him. In New York, NBC-TV announced Elvis would not be able to 'bump and grind' on the forthcoming "Steve Allen Show" where he agreed to appear - against his better judgment - in a tuxedo. Despite this gesture to conformity, Elvis led the teenage rebellion during 1956 and changed popular music forever. In 1957, "All Shook Up" became the new catch-phrase on both sides of the Atlantic and gave Elvis' first UK No.1. Elvis had also fulfiled another of his dreams by becoming a movie-star. His second motion-picture "Loving You" was released in July and the No.1 soundtrack album featured the rock'n'roll classic "Mean Woman Blues" Elvis' third and fourth movies considered by many critics to be his best, were "Jailhouse Rock" and"King Creole. "Artistically, 1958 was another good year for Elvis. In January, "Jailhouse Rock" c/w "Treat Me Nice" became the first Elvis single to debut at No.1 in the NME UK singles chart. "Wear My Ring Around Your Neck" reached No.2 in May and "Hard Headed Woman" from "King Creole reached No.3 in July. In March however, Elvis had to report to the Memphis Draft Board for his induction into the US Army and many observers, including Elvis, thought this would be the end of his career. Colonel Parker, Elvis' manager had other ideas and on June 10th, Elvis attended a recording session in Nashville. This would allow RCA to issue material while he was away serving Uncle Sam. Several of these songs; -A Fool Such As I", -I Got Stung". "I Need Your Love Tonight" and "A Big Hunk 0' Love" kept Elvis' name in the charts throughout 1959. The later reached No.4 in the NME UK singles chart in August. Elvis was discharged on March 5th, 1960 and by April 3rd, he had recorded some of the most outstanding vocal performances of his career. In addition to "Are You Lonesome Tonight?" and "Fever" he cut "It's Now Or Never", which went on to become Elvis' biggest selling single of all-time. It stayed at No.1 on the UK singles chart for 8 weeks. So, 2 years away from the media spotlight. Elvis was back with a vengeance. His movie career blossomed and films like "G.I. Blues", "Blue Hawaii" and "Girls! Girls! Girls!" spawned No.1 hits like "Wooden Heart", "Can't Help Falling In Love" and "Return To Sender" respectively. Between 1960 and his untimely death in August 1977. Elvis would hit the top spot a further 13 times, deliver 36 top hits and inclusively, 75 top 50 hits! This album really is 'classic Elvis.' It provides a unique testament to Elvis who truly was the king of rock'n'roll. All label copy and sleeve notes ©, the Camden Record Label, a division of BMG Entertainment International UK & Ireland Ltd. Customer evaluation for "Classic Elvis (CD)"